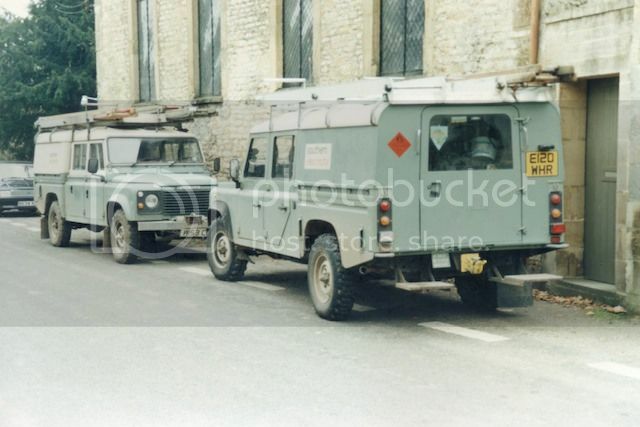 SEB Vehicles: Land Rover 90, 110 & 127. 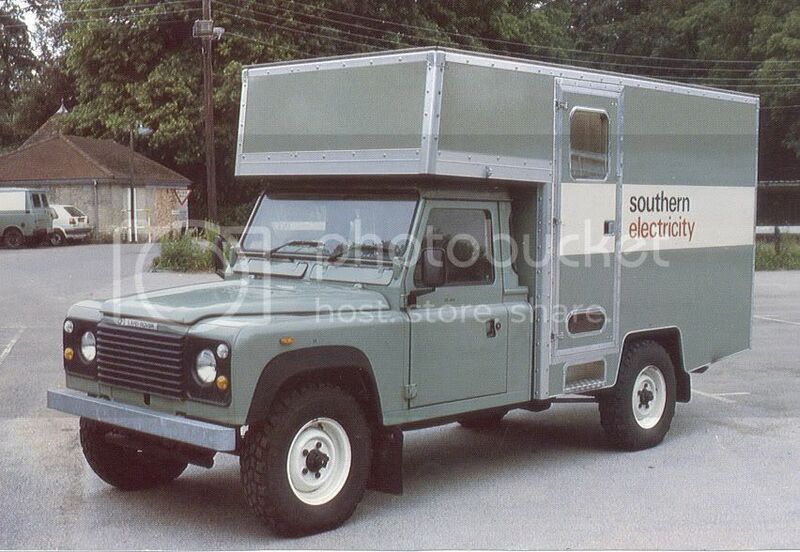 With the end of production of the 1-Ton 109" Land Rover in 1977, SEB had to work hard to find a suitable replacement vehicle. 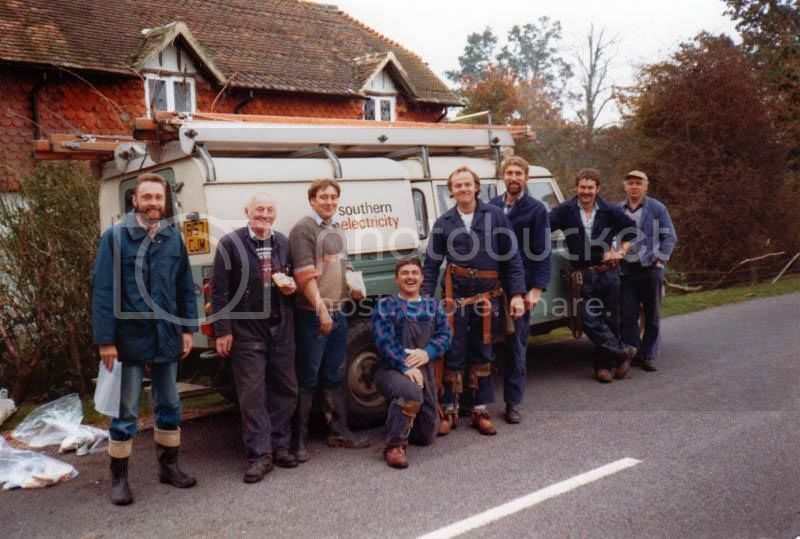 They used the UAZ vans as detailed in an earlier post, as well 4x4 versions of popular Bedford vans. 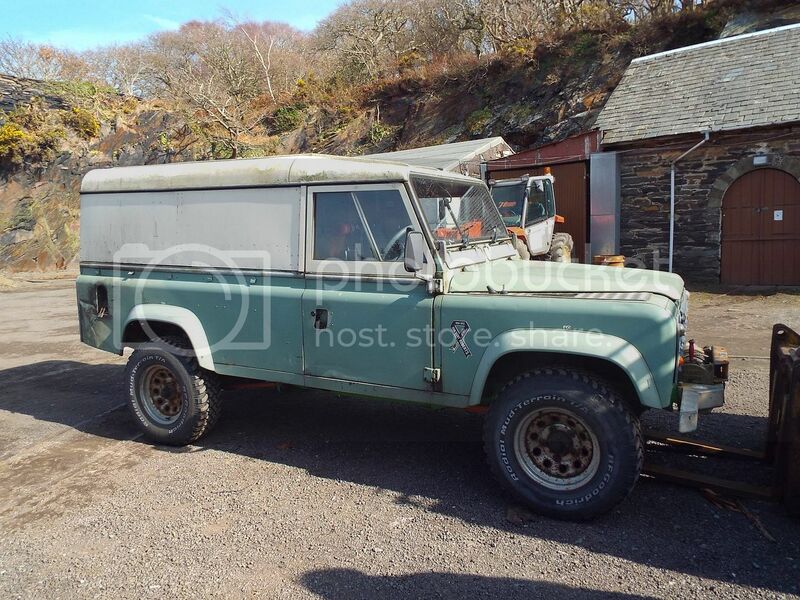 By the early 1980s Land Rover was undergoing significant change as a business, and had sought to improve an upgrade its products. 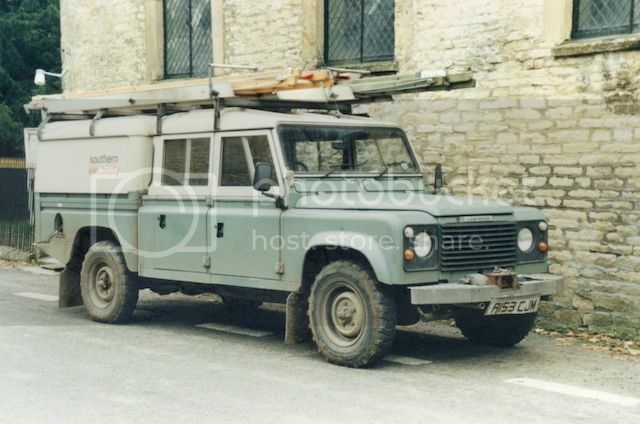 The arrival in the late 1970s of Land Rovers with V8 petrol engines was the first big upgrade, a few years later came coil spring suspension, which improved ride comfort. 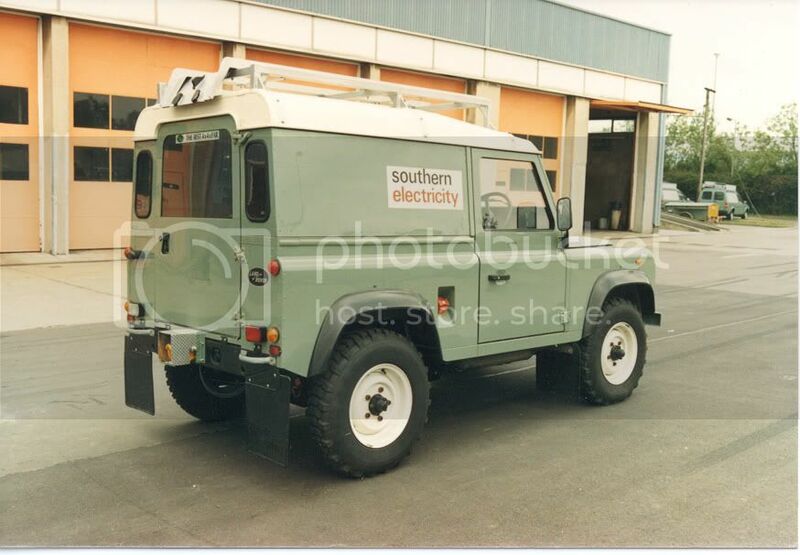 The "new" 90 (swb) and 110 (lwb) utility vehicles otherwise did not offer much more than the old 88" and 109" had, and SEB were still struggling with the lower payloads on offer even from these new vehicles. 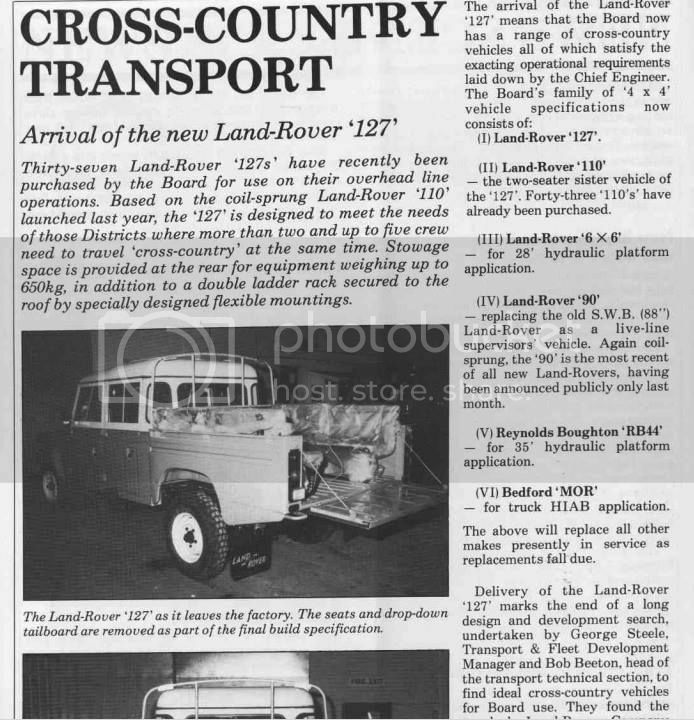 Not long after the 110 had been launched in 1983, work began on a new purpose-built Land Rover for utility use, and the vehicle eventually was named the 127 after its 127" wheelbase. 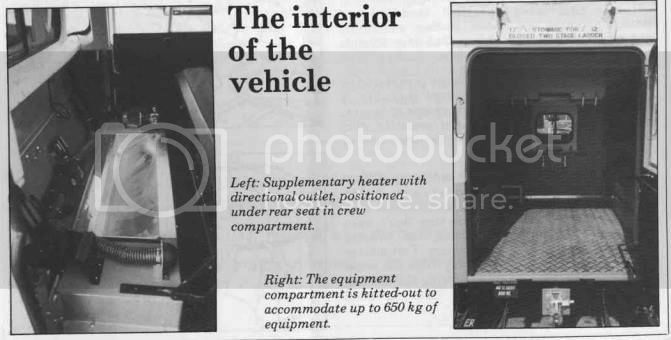 The 127 was essentially an extended 110, offering a crew-cab body to seat five (or six if the centre front seat was fitted) with a load carrying compartment at the back. 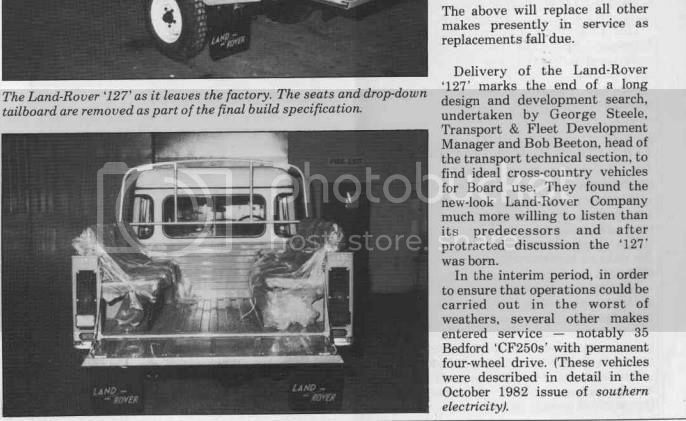 The vehicle was apparently designed with input from SEB, and when production began some of the first examples were sold to SEB. 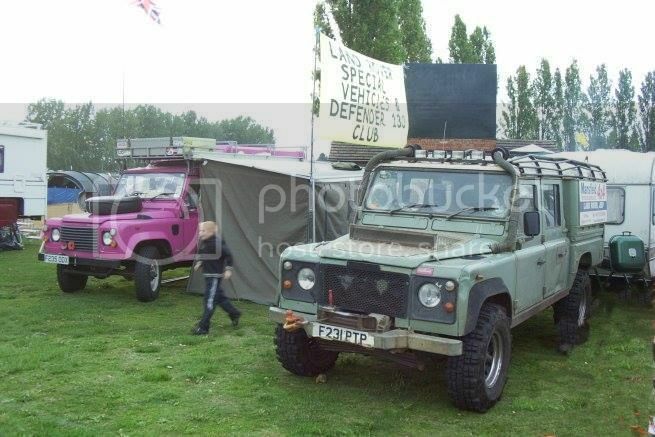 Many of the 110 and 127 vehicles appear to have at least initially been V8 engined, although later vehicles were diesel-powered. By the mid-late 1980s, SEB was experimenting with fitting the Range Rover type three-speed automatic gearbox into 110s, however this was not very successful when mated to the only moderately powered 2.5TD engine. 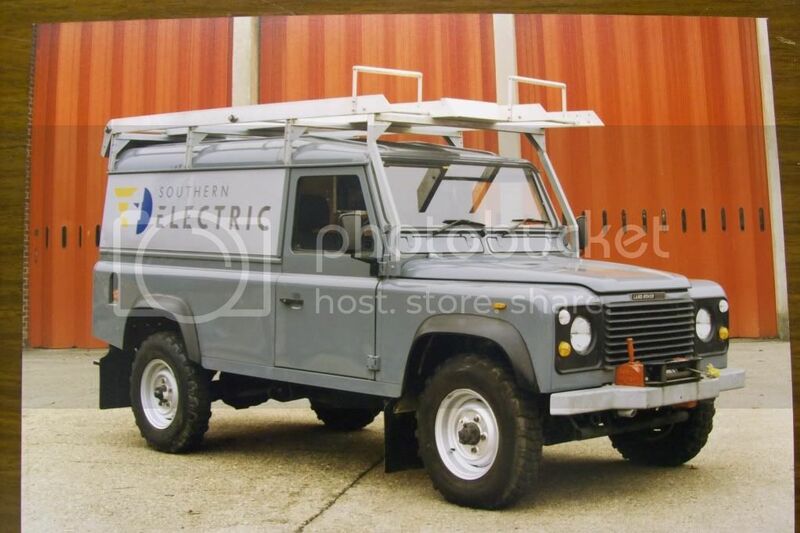 SEB took on all coil-sprung models of Land Rover, 90s apparently as chargehand or engineers vehicles, with the 110 and 127 as overhead line crew vehicles. The 90 and 110 did not change too much in the early years, but the 127 did get a change to the rear doors after about 12 months production, from square bottomed rear doors to using the same doors as on a 110 station wagon. The 110 was also updated at the same time to the one-piece doors with winding windows. The 90 was never sold with split doors, as the 110 and 127 were on sale for about a year before the 90 was introduced. 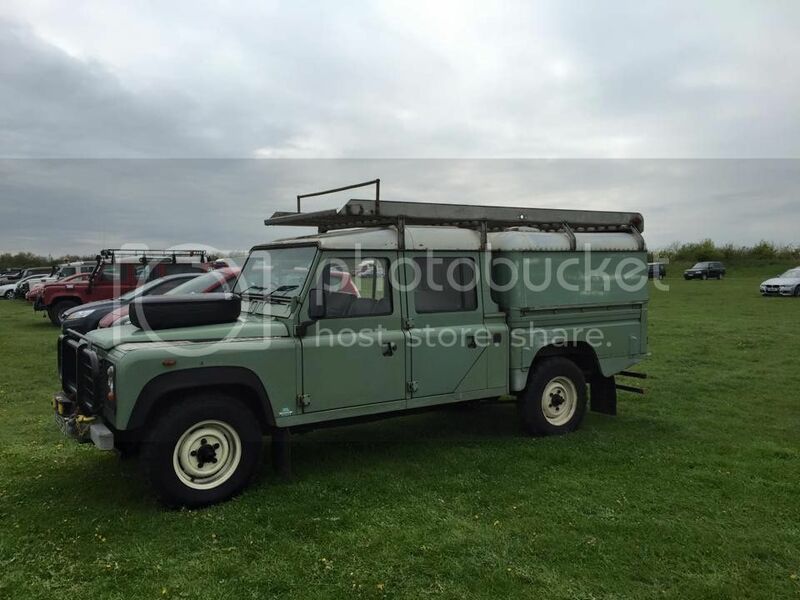 An early 90 hard top. 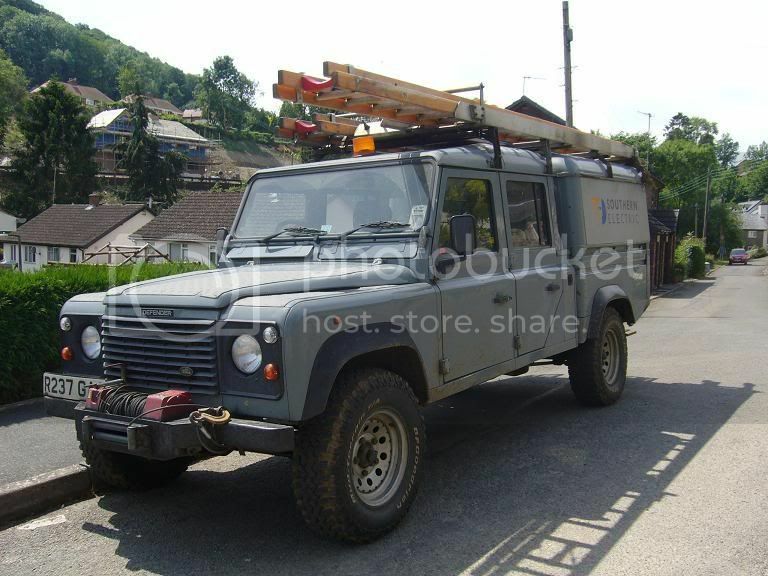 A 90 hard top with the 2.5 Turbo diesel engine. 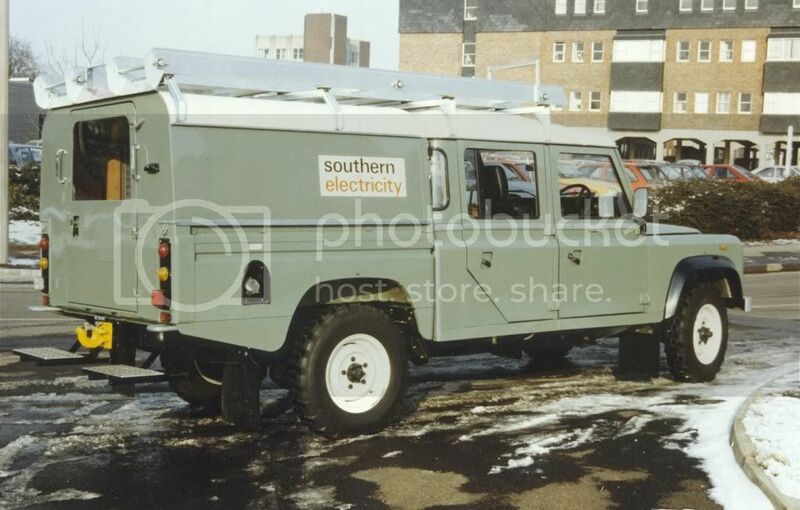 Few photos exist of SEB 110s, however this ex-SEB vehicle gives some idea of the in-service appearance. This 110 is seen in the post-1989 colour scheme. It was originally a green vehicle. 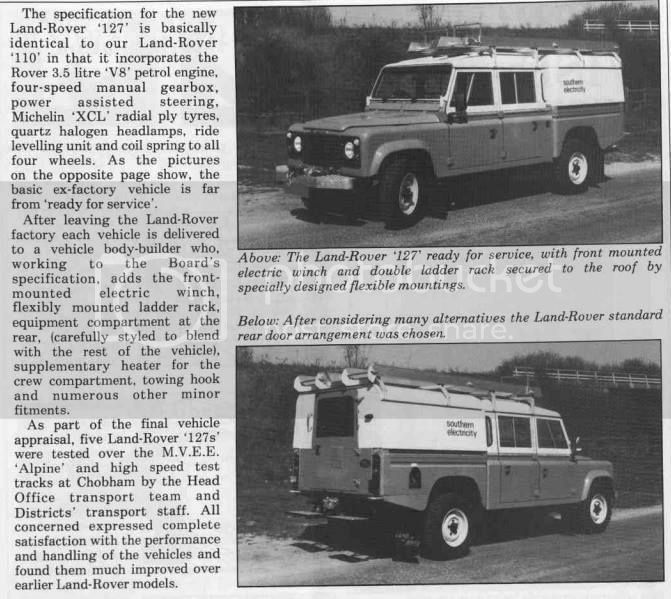 The following is a reproduction of an article in the SEB staff magazine about the 127 and other new Land Rovers. An early 127 in use on storm repair work. An early 127" based at Oxford, showing the square-bottomed rear door. 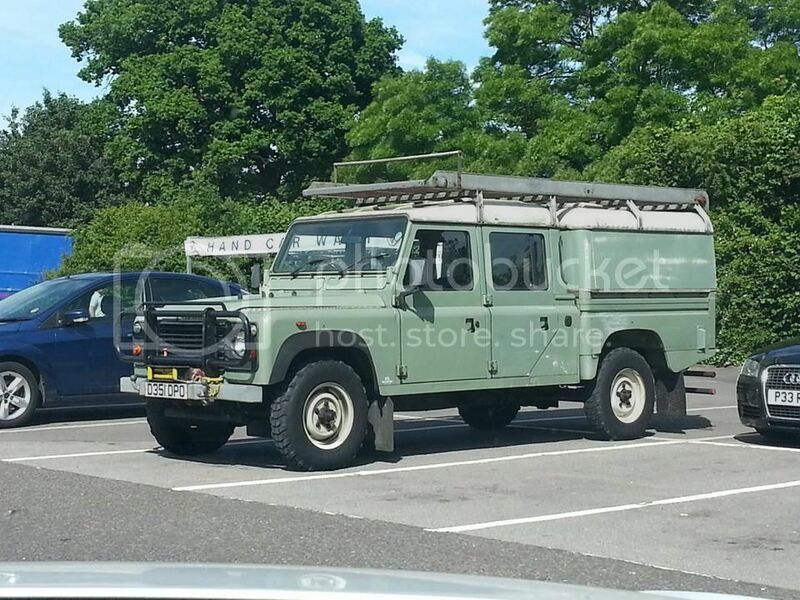 Compare with this photo showing a slightly later vehicle, which also has the later door handles. 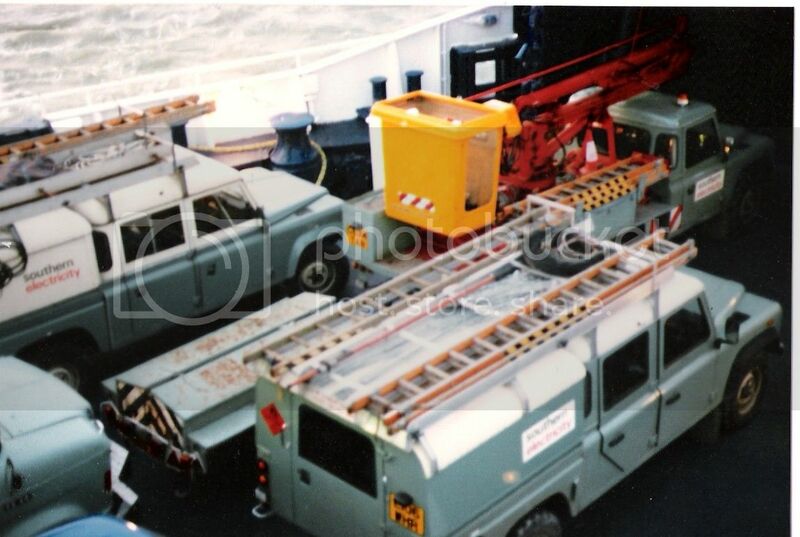 This photo of vehicles on the ferry to the Isle of Wight also shows the early and later types. 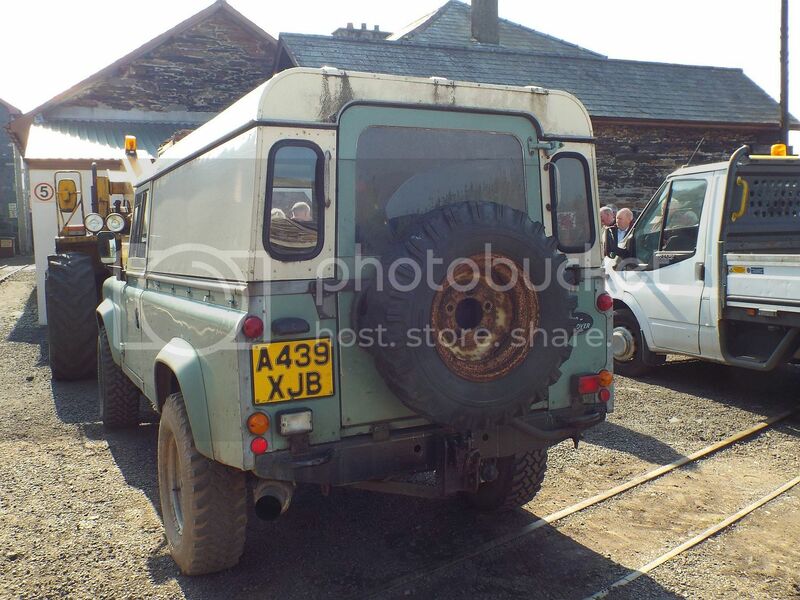 However there was an intermediate type with the cut off doors but lift-up door handles. 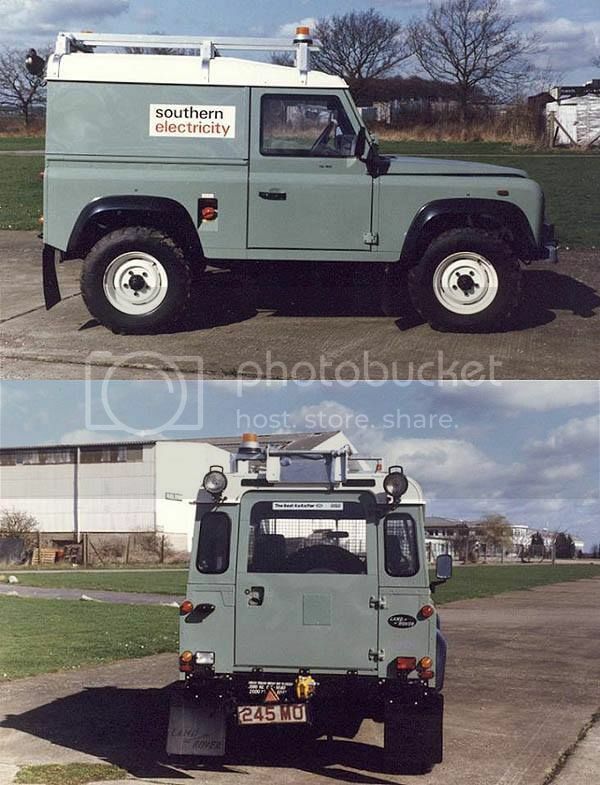 This special-bodied 127 was an IT fitters vehicle. 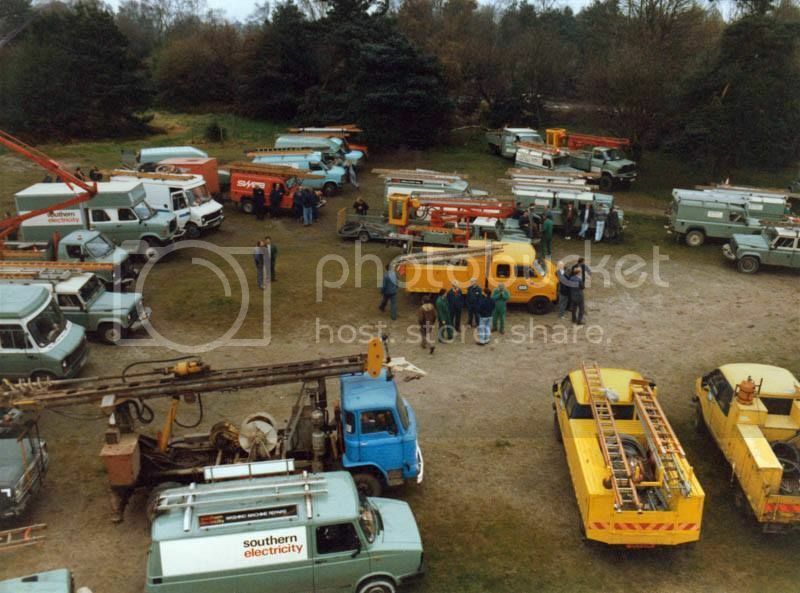 This photo taken on a multi-board storm repair job shows several early 110 and 127s in use with SEB. Notice the slight variations in colour scheme. ...whilst some became off-road monsters. 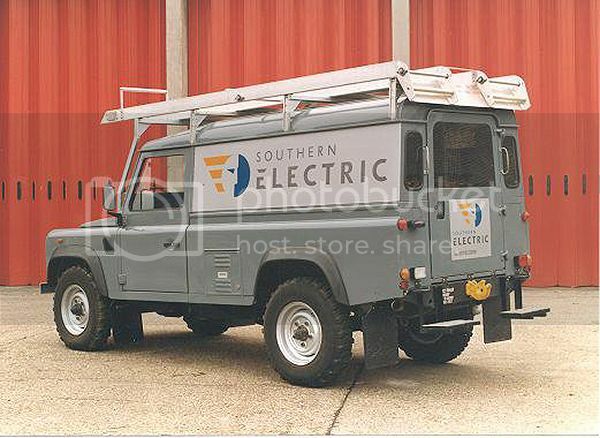 The 127 was renamed the 130 as part of the "Defender" re-brand in 1990/1, but the vehicle itself was little changed, This was one of the last to go to Southern Electricity before they became SSE, and was powered by the Tdi engine. Similar vehicles are still in use today.